Vinayaka Chathurthi Wishes to Everyone!!! How did Lord Ganesha's birthday celebration go everyone?? We did a small pooja and offered Lord Ganesha with flowers and his favorite Sweet Modak. Being a week day everyone here found their way to school and office after the Pooja. ﻿Here is the recipe for the Modak made at home for Ganesh Chathurthi celebration. You can make them home anythime for breakfast or snack. 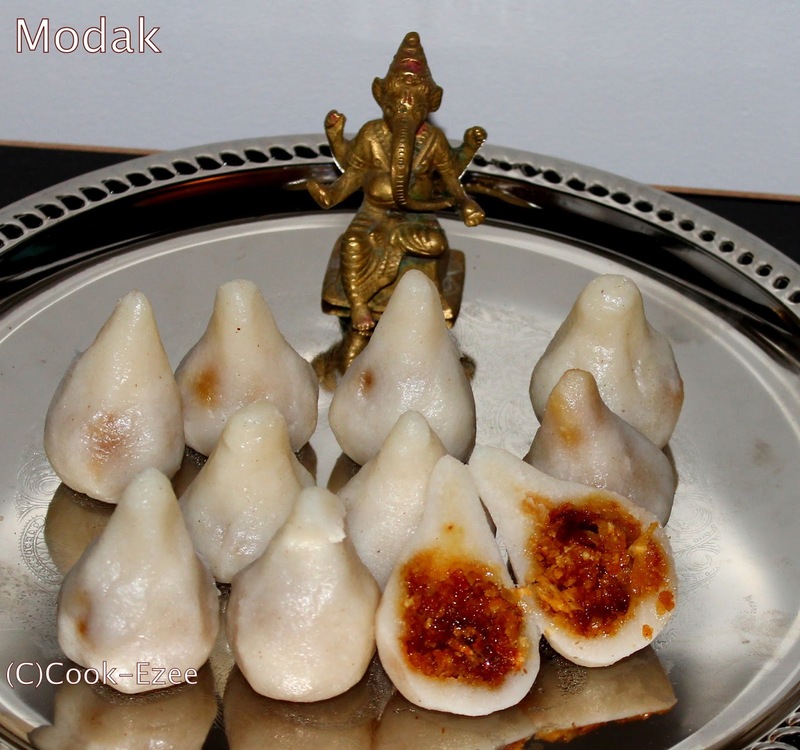 Everyone here love Modak, especially the little ones. So make this home for your loved ones and Enjoy !!! Put the rice flour into a wide bowl. Pour the boiled water to the flour little by little mixing well with a spoon or spatula till the flour is well combined. Once the heat is reduced, knead the flour to a smooth dough without any lumps. Apply some oil or ghee and smoothen the dough. For filling, heat a pan, add oil/ghee and saute the grated coconut till it start giving nice aroma and light brown color in medium heat. Meanwhile boil water in a pot, add the jaggery cubes and melt it completely. Filter the jaggery syrup to emove any impurities. Add this jaggery syrup to the sauteed coconut and keep stirring in medium heat till the mix become sticky. Add the cardamom powder and stir well to mix. Make sure the mix is not not too dry and hard. Take off the stove and let it cool a bit. Once the mix is of tolerant hot, take a tsp each and make small balls. Now apply some water in your left palm, take the rice dough small and place in the hand and flatten it making the edges a bit curvy. Repeat the process with rest of the rice balls and filling. Steam them in a steamer or idli cooker for around seven-ten minutes. Take off the lid of the steamer and let it cool a bit. Move to a serving dish and Serve Warm. Madhura kozhukaata looks deliicous Prathiba. tempting kozukattais n nice lit ganesh..